The 1914 Vauxhall 25hp ‘Prince Henry’ Sports Torpedo – perhaps the world’s first sports car – leads the Bonhams’ Bond St 2016 sale in London. Other top entries include a 1957 Mercedes-Benz 300 SL Roadster, a “James Bond” 1963 Aston Martin DB5 with two-owner faultless records and an early 1968 Maserati Mistral 4000 Spyder. A 1926 Rolls-Royce Phantom I with an interior like a Versailles throne room is a further unusual car on offer. Of the early entries, a 1957 Mercedes Benz 300 SL Roadster (estimate £1 to 1.2 million) is the most-expensive car on offer but the unique 1926 Rolls-Royce Phantom I (estimate £500,000 – 700,000) and the 1914 Vauxhall 25hp ‘Prince Henry’ Sports Torpedo (estimate £500,000-600,000) are attracting the most attention. 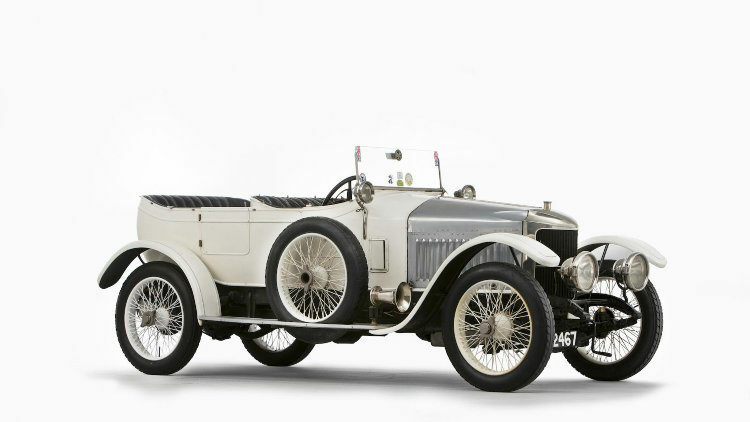 The world’s first sports car – the 1914 Vauxhall 25hp ‘Prince Henry’ Sports Torpedo – is coming to auction for the first time in Bonhams’ Bond Street Sale on 4 December 2016, estimated at £500,000-600,000. Many of the world’s motoring historians have acclaimed the ‘Prince Henry’ Vauxhall as the very first sports car. Designed by much-admired Vauxhall engineer Laurence Pomeroy, this car was named after Pomeroy’s success with the 20hp A-type in the 1910 Tour of Prussia – an event instigated by Prince Henry of Prussia. Pomeroy’s design, first offered in 20hp, was unveiled in 25hp form at the Olympia Exhibition of 1912. Original ‘Prince Henry’ Vauxhalls are scarce – the 25hp model even scarcer. Featuring a high waistline, narrow torpedo coachwork and raked windscreen, this is a particularly handsome example. With the required re-commissioning it deserves (following 102 years of enthusiastic use), it will take its place among the World’s Great Cars – not only on at concours d’elegance events, but in long-distance motoring races where it can demonstrate its Edwardian sporting credentials. With only four owners to its name, the car’s provenance is flawfless. The first owner, T. W. Badgery, commissioned Messrs Hoskison Ltd. of Aston Cross, Birmingham to build the elegant sports torpedo body, paneled in aluminum with fold flat one-piece windscreen and tonneau cover. Converting the car to run on a 5.25 x 22 inch wheels, he completed numerous tours, clocking up 140,000 miles by 1931. Recalling those trips he told motoring journalist Marcus Chambers that he ran the car on ‘Castor Oil, second pressings’ from his own leather works. In 1945 Laurence Pomeroy Jnr. – the great mechanic’s son, Vice President of the 500 Club and President of the Vintage Sports-Car Club – bought the Prince Henry. As a child his father had built him a pedal-car version of the same Prince Henry model. He was to compete in the full-size model regularly during the course of his 21 year ownership. 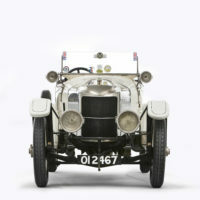 Following his death in 1966 it came into the hands of Nick Ridley, President of the Veteran Car Club of Great Britain. Ridley was to campaign the car in veteran and vintage events until 1970 when it changed hands for the last time into the ownership of another Veteran Car Club President, the late Reg Long. During Long’s 46 years of ownership, ‘Prince Henry’ was the flagship car on many Continental tours, its striking styling drawing the largest crowds and regularly winning awards, including the Veteran Car Club’s The Lord Trophy. Under Long’s care the car was featured in many motoring publications, was invited to the opening of The National Motor Museum at Beaulieu in 1972 and ‘starred’ in the 1973 film, An Aspidistra in Babylon where it was driven by Jeremy Brett. The Prince Henry boasts not only outstanding provenance and connection with prominent establishment figures, but also specifications fit for fast touring – CAV lighting and switch panel, gaitered springs, two piece tonneau cover, running board mounted electric klaxon, dashboard-mounted Bosch starting magneto and air pump, Smiths 8 day clock and oil and water gages, a White & Poppe Ltd fuel carburetor and a Bosch ZU4 magneto. A 1957 Mercedes-Benz 300 SL Roadster, estimated at £1,000,000-1,200,000, is likely to be the most-expensive lot at the 2016 Bonhams Bond Street Sale in London. A supercar long before the word was coined, the 300 SL spearheaded Mercedes-Benz’s return to competition in the post-war era. The early model debuted in the 1952 Mille Miglia, gaining 2nd place before going on to win in the Carrera Pan-Americana and at Le Mans. This early promise of sporting prowess was confirmed in the 1954 Coupé production and later in the 1957 Roadster. One of the fastest convertibles of its time, the Roadster accelerated 0-60mph in 7 seconds, hitting a top speed of 130mph. This spectacular, matching numbers example left the factory for Indiana, USA on 9 December 1957. Five owners later, the car retains many of its original features – English instruments, sealed-beam headlights, ‘Made in Western Germany’ plaques, Becker Mexico radio, reversing light and 3:89:1 ratio rear axle. Returning to Europe in 1997, the car was bought by a German collector for whom the engine was rebuilt, European headlamps, cognac leather interiors and a black soft-top fitted. Since then, the machine has been treated to a bare-metal repaint in Anthracite Gray. Freshly serviced and in excellent condition, this is a beautifully preserved example of one of the 20th Century’s most iconic automobiles. However, at recent auctions, Mercedes Benz 300 SL prices have been weaker than a year or two ago with the occasional example going for below a million dollar. The 1963 Aston Martin DB5 4.2L Sports Saloon, estimated at £570,000-610,000, brings a bit of 007 spirit to the aucion. The DB5 is widely known as the James Bond Aston Martin having appeared in no fewer than five movies of the series, beginning with Goldfinger in 1964. Outwardly there was little to distinguish the DB5 from the last of the DB4s, the distinctive cowled headlamps still a prominent feature. But beneath the skin there were numerous improvements including alternator electrics, Girling disk brakes, Sundym glass, electric windows, an oil pressure gauge and a 4.0-liter engine with three SU carburetors; the ‘400’ engine produced 282bhp at 5,500rpm and was mated to a four-speed/overdrive gearbox. The 1963 Aston Martin DB5 4.2L Sports Saloon on offer at Bonhams was the eighth DB5 ever sold. It comes with original records showing that the car was finished in Goodwood Green with White Gold interior trim (its present livery) and left the factory equipped with chrome wheels. The car was sent to Sydney (Australia), where its first owner kept it in until 1994, the second until 2016 during which time the vehicle was comprehensively restored (unleaded conversion, engine enlarged to 4.2-liters, body repairs, repaint) by renowned marque specialists Richard Williams Ltd. This is a two-owner Aston of James Bond glamor and flawless records. The 1968 Maserati Mistral 4000 Spyder Chassis, estimated at £520,000-580,000, is a low mileage example in very original condition. Maserati began producing road cars in the ’60s, beginning with a series of six-cylinder classics. Last of these was the Pietro Frua-styled Mistral. A handsome two-seater on a shortened, square-tube chassis, the Mistral was a popular machine. Production ceased in 1970, by which time a total of 37 4.0-liter Mistral Spyders had been built – making this particular model one of the rarest variants. This 4.0-liter Mistral Spyder with five-speed manual gearbox was shown at the 1968 Naples Motor Show before being shipped from Venice to South Africa aboard the ‘Europa’ where its first owner kept it until his death in 2010. Since then it has seen two owners who, as with the first, have made few changes to the original machine. In addition to matching numbers, this Mistral boasts a totally original interior, including leather seats, ‘Maserati’-embossed floor mats, and under-bonnet and boot lid quilting. The hood and hood cover are original as is the Lucas fuel injection system with Lucas ‘bomb’ type fuel pump. Even the Maserati fuel filler cap, Carello lights and trims, windscreen wiper arms, windscreen and all other glass are factory specification. The original tool rolls sit in the boot alongside the original owner’s handbook and worldwide dealer book. The most original and low-mileage Mistral Spyder in existence, this is a dream come true for any aficionado of fine thoroughbred sports cars. A 1926 Rolls-Royce Phantom I with coachwork by Brougham De Ville (Registration no. YE 939, Chassis no. 76TC) is with an estimate of £500,000 – 700,000 ($610,000 – 850,000) one of the highlights of the 2016 Bonhams Bond Street Sale. The car famously has an interior inspired by the sedan chair of Marie Antoinette and more resembling a Palace of Versailles throne room than a standard car interior.